In the previous post, I tried to present a conceptual overview of a liquidity crisis using a bank's balance sheet: Bank Balance Sheet: Liquidity and Solvency, Part I. Note: I combined various types of financial institutions to illustrate a few points. As we continue the story, the bank has suffered some losses, but the bank run has been halted by the efforts of the FDIC (increasing insurance limit), or the Fed (by providing liquidity). This time we look at the bank's assets. 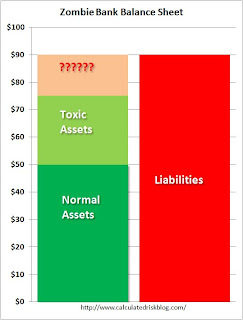 What I've labeled as "normal assets" are various categories of assets, perhaps commercial & industrial (C&I) loans, consumer loans, and others. Although the charge-offs are increasing for all of these loans during the recession, these assets have a market value or otherwise are in OK shape. 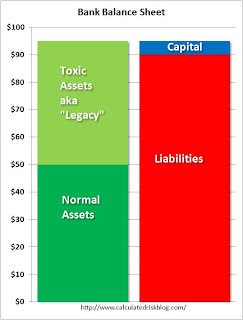 The banks are facing huge additional losses for these legacy assets, and these losses will make some banks "balance sheet" insolvent (liabilities will be great than assets). However, the bank is not insolvent in the business sense, because the bank can still pay their debts as they come due - at least for now. But these future losses (even just the fear of future losses) will make it impossible for the banks to borrow or raise additional private capital. So Paulson's solution was to remove the legacy assets from the bank's balance sheet. This was the purpose of the Master Liquidity Enhancement Conduit (MLEC), the original purpose of the TARP, and even the goal of Geithner's PPIP. 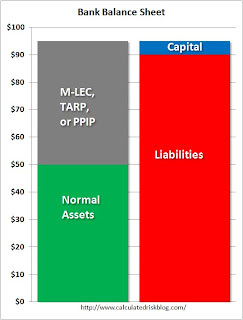 Basically the goal is to replace the legacy assets with money from the MLEC, TARP (original plan) or the PPIP. All of these programs suffer from the same problem. If they buyer's pay too little, the banks will be insolvent, and if the buyer's pay too much for the assets, this is a transfer of wealth from the buyers to the stakeholders of the banks. The PPIP uses private buyers to set the price, but it suffers from the same problems as the MLEC and TARP (original). Because of the structure (with a non-recourse loan), the buyers can pay more than market value because they have a put option (they have minimal downside risk). This put option is a transfer of wealth from taxpayers to the stakeholders of the banks. If the PPIP buyers bid too little, the banks will reject the bid - I think this is a likely outcome. Because of pricing issues for legacy assets, the TARP was changed to inject additional capital into the banks with preferred stock. This additional capital provides the banks with a little more cushion to handle losses, but if the value of the legacy assets is - say - cut in half, the banks will still be balance sheet insolvent. This might help some banks, but other banks will still need additional capital. And there is the question of what percentage of the bank should the government own with the additional capital. If the banks were seriously insolvent, why aren't the original shareholders wiped out? Once again this is a transfer of wealth from the taxpayers to the existing stakeholders. The FDIC approach (aka Preprivatization) would be to seize the bank, and wipe out the shareholders. The government would take all the legacy assets and create a new Resolution Trust Corporation (RTC) like institution to dispose of the assets. The bank would be recapitalized and eventually sold to the public as a much smaller institution. There are a range of possibilities on how to handle the debtholders. They could receive a haircut, and perhaps an interest in the RTC assets (above a certain price), and maybe an equity interest in the New Bank. Or, at the other end of the spectrum, they could be paid off in full. This would probably depend on any systemic issues. The Geithner approach is to keep injecting capital into the banks to cover the losses. This is known as the "Zombie" bank approach. 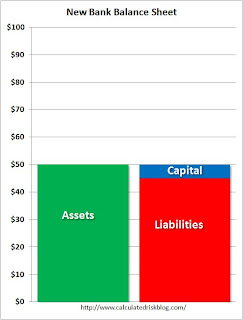 In essence the balance sheet looks like this with liabilities greater than total assets. To make the zombie balance sheet "balance", I've added "??????" to the assets. These "??????" assets are either future retained earnings or additional money from the government. 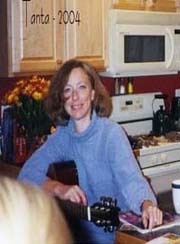 Although the bank is balance sheet insolvent, the bank will never be business insolvent because the government will continue to provide money to cover losses. If only a small percentage of financial assets are held by zombie banks, then this approach will probably work. These banks will be crippled, but the other banks can meet the financing needs of the economy. This is why the stress tests are so important in helping identify zombie banks - and why financial institutions relying on government support should be required to make the entire test results public. If there are too many zombies, we need to insist on preprivatization.